My 3GS was shutting off whenever it dropped to 60-70% battery life for a few months. I'd have to plug it in to reboot and then after a few minutes it would tell me I had < 5% charge or whatnot. It got worse and would die constantly in the 95% range, but would still reboot sometimes with some battery left, but usually only successfully if I was plugged in. So I figured it would be cheap/easy to try to replace the battery on it. I, regrettably, tore into the thing pretty aggressively and cannot get a carrier signal at all after reassembling it. At one point, I was able to occasionally get a single bar of service for a matter of a couple seconds, but for the most part, just no service at all. Now I can't even get that much. In the numerous attempts to reassemble, I seem to have messed up ribbons 6 and 7. They won't stay connected, which is why I have the soldered wires shown here http://i1211.photobucket.com/albums/cc42... (the left one and the lower right one connect the ribbon to the terminals). I'm sure that ribbon 6 is the least of my worries, though my wifi only works within 2 rooms from the router and I don't think my GPS is working, or camera for that matter, but I'm most concerned about getting my carrier signal back. 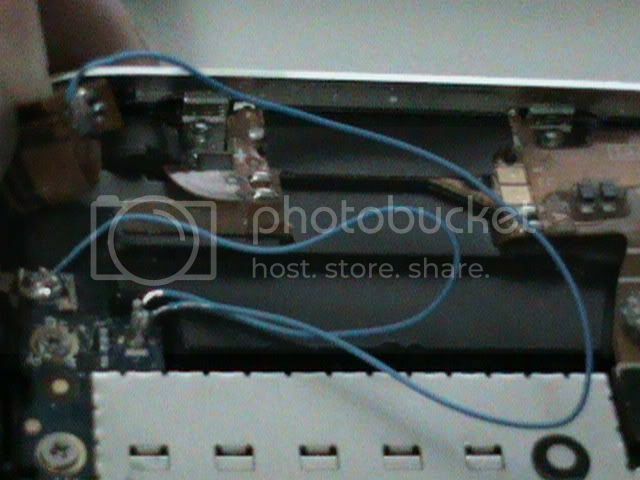 So this picture illustrates what I currently have setup around ribbon 7 http://i1211.photobucket.com/albums/cc42.... You can see the wire on the right connects the ribbon to the terminal. The other wire was something I just added in a futile attempt which attempts to bridge the antenna (which is also terminal 7, right?) to the tab that forks up to connect to the bezel. I'm at a loss as to what to try. I've made sure the 2 tabs make a good connection to the bezel casing and also from what I can tell, the two inductors next to the antenna (where ribbon 7 connects?) seem to still be in place, The extra wire was an attempt to try to bypass those in case I screwed them up, based on what I read in http://www.mauron.net/iphonerepair/ which seems to be more focused on the 3G model. Can anyone provide some help on what to try? Or have I tinkered too much that all hope is lost? I can provide additional photos if needed. Thank you for the response pollytintop. I just now tried replacing the full lower dock assembly including new antenna, but still have no luck getting any signal. I removed all extra wires and solder I had previously used to make a good connection. I still can't get the 6 and 7 ribbon cables down on the pads and right now have them taped down with electrical tape. I even tried running the phone with the case slightly open so I could force ribbon 7 into making contact but still no signal. I'm willing to try the method of scraping off the cover over the trace, but need some more guidance on how to do that. I'm relatively new to these repairs. Unfortunately my local iphone repair shop won't attempt a repair either. If anyone is near Orlando Florida and might be able to help, please let me know. Or if anyone else has suggestions, I'm not afraid to try. Thank you! I haven't had to sort out a 3gs, I work mainly on the 3g...however I have sorted out the antenna problem ala mauron and it worked brilliantly. If as you say you "tore" in to the phone, I'd think that you have bent/broken one of the internal wires from the connnector/antenna to the mainboard. The only way forward for you is to turn the board over and start scraping off the cover over the trace and following it until you find the break...pretty sure it can only be on that corner of the wing. the principle is the same for both 3g/3gs and that "wing" is easily bent trying to prise it out from the bezel to get to the battery. just to be sure...your antenna (no.7 has been replaced? sure that isn't the problem? )ps you can buy the no.7 connector for your board if you ever decide to make life easier again. the part you are interested in scraping back is the darker blue line. so starting from where the wing inserts into the board to the funny looking connector that doesn't do anything. I used a flathead screwdriver to gently scrape the plastic coating up. next clean the exposed wiring, then flux, solder or tin along that line of wiring. hopefully this will fill any break in the wire which is causing your problem. the soldering needs to be pretty flat as you need this all to fit back in the case. i got enthusiastic and soldered round the circle part too (has no function but mine was cracked and I was solder happy!) and then couldn't get the board back in.. then I'd reinsert the board and see if it has a better signal. If not then you'll need to perhaps look at following that blue line round to the gold contacts. Have you made sure that the gold wing on the motherboard is making good contact with the board? you may want to just check that you haven't pulled it loose in your enthusiasm. Thank you for the response pollytintop. I just now tried replacing the full lower dock assembly including new antenna, but still have no luck getting any signal. I removed all extra wires and solder I had previously used to make a good connection. I still can't get the 6 and 7 ribbon cables down on the pads and right now have them taped down with electrical tape. I even tried running the phone with the case slightly open so I could force ribbon 7 into making contact but still no signal. I'm willing to try the method of scraping off the cover over the trace, but need some more guidance on how to do that. I'm relatively new to these repairs. Unfortunately my local iphone repair shop won't attempt a repair either. If anyone is near Orlando Florida and might be able to help, please let me know. Or if anyone else has suggestions, I'm not afraid to try. put some photo's on of where you're at now with solder on the trace... and which inductors you've soldered/broken.. Removed the small sticker next to the battery contacts that covers some lines leading into the antenna. There was a small divot at the other end of the lines. I soldered a wire from there to the pad the has the tab that connects to the casing and now have normal service! Wifi still poor and camera broken, but I'll settle for that for now! It sounds like you may have broken the little resistor in between the antenna and the screw under the "Do Not Remove" sticker. I did this once while replacing a battery as well and all of the symptoms you are describing were the exact same ones I was having. From everything that I've read, that resistor is only there for testing purposes when building the phones in the factory. You need to jump those two connector points with a dab of solder so they make a solid connection. Put it all back together and see if it works. Hope this helps! Thanks magistry. Makes sense and I agree that's probably what happened. I did get that understanding when I had read the mauron article as well, but was not sure exactly how to do it on the 3GS. Is it not actually two resistors (inductors?) next to the antenna? Is it only the one immediately to the right of it (lower one) in the picture you linked? To repair it I can just put a dab of solder on it? Do I do this on the top of the board or under it (sorry I don't have much of an electronics background). Thanks! Look forward to trying it when I get home later. Hi pollytintip. I tried magistry's suggestion and had no luck, so I removed the solder and tried scraping off the board as you mentionned. I'm scraping off the bottom right corner in the photo you linked correct? I saw some copper between it, the small oval piece , and the connector for #7. I soldered over it to make a connection between them all, but am still not sure what I am doing is correct. I still can't get any service Are you able to provide any additional help? Added pictures to the main question. Thanks. It's ok! I had to buy a soldering gun just for the repair lol. Just a dab of solder did the trick for me on the top side of the board where the resistor/inductor/capacitor/whatever it is is supposed to be. Ok magistry, I'll open it up now and give it a go! No luck :( I tried soldering over the resitors/inductors, tried another time with the solder touching the antennae #7 contact point, nothing. Removing the solder I think I ripped off the inductors as well, but from what I read thats not a big deal. Soldered with no inductors on, still nothing. Man :( Something else might have broken in the process of doing everything. I wish I had taken a picture of the 3G that I fixed but I had no idea that it would actually work until I put it all back together and tested it and there was no way I was going to pull it all apart again once I got it working lol. Keep us updated please. The last owner of my iphone changed the battery of my actual iphone 3gs since a year and he had the same problem of signal since that, I bought the phone for a low price because its has this kind of problem. I was thinking to sell the phone as a bad functioning iphone for nothing of money, but now it works really good. I always thought this was a hardware problem or something broken in the antenna, but now I think that maybe depends of the battery cycles. or not? the iphone its working really good.